The past 7th and 8th of March took place in Warsaw the Annual Meeting of the Imcustomeye project. The event was hosted by one of the partners of the consortium: the Institute of Physical Chemistry of the Polish Academy of Sciences. The IMCUSTOMEYE partners, academic, clinical and industrial, attending the meeting gave an update on the research and technology progress during this past year. The meeting concluded with a discussion about the product commercialization perspective. 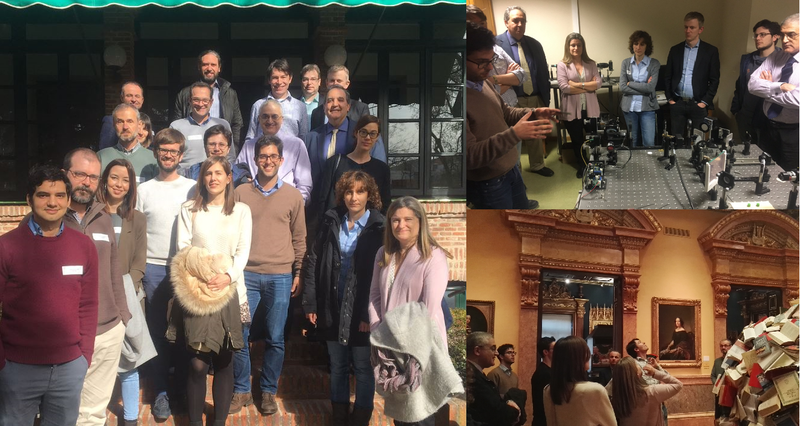 The commercialization meeting of the IMCUSTOMEYE project took place in Madrid (Instituto de Óptica, CSIC) on November 2018 led by the partner IROC Science. The IMCUSTOMEYE project will develop a new optical imaging system that will allow to obtain biomarkers to improve the diagnosis of a certain range of vision-threatening conditions. The main objective of the two day meeting was to establish new strategies for the development and commercialization of the Imcustomeye technologies defining their market perspective and potential applications. Each of the attending partners also gave an update on R&D status, which led to a product development roadmap. The IMCUSTOMEYE consortium consists of 10 partners, from 6 different countries and different fields, academic, clinical and industrial. The attendees to the meeting were: IROC Science, CSIC, National University of Ireland, Polish Academy of Science, University of Liverpool, University College London, Oculus Gmbh, 2EyesVision SL and Optimo Medical AG. ​Application of the air‐puff swept source optical coherence tomography (SS‐OCT) instrument to determine the influence of viscoelasticity on the relation between overall the air‐puff force and corneal apex displacement of porcine corneas ex vivo has been demonstrated. Micrometer resolution, fast acquisition and noncontact character of the air‐puff SS‐OCT measurements have potential to improve the in vivo assessment of mechanical properties of the human corneas. This work was successfully published in Journal of Biophotonics. Full reference: Maczynska E, Karnowski K, Szulzycki K, Malinowska M, Dolezyczek H, Cichanski A, Wojtkowski M et al. Assessment of the influence of viscoelasticity of cornea in animal ex vivo model using air‐puff optical coherence tomography and corneal hysteresis. J. Biophotonics. 2018; e201800154. Dr. Andrea Curatolo received Young Investigator Award for his presentation entitled "Customised optical coherence tomography system for corneal deformation imaging on multiple meridians" at Reunion Nacional de Optica, the Conference of the Optical Society of Spain, Sedoptica, which celebrated its 50th Anniversary. The award is co-sponsored by the Optical Society of America, and presented by Prof. Chris Dainty, past OSA President. Dr. Curatolo presented the first swept source OCT system for air-puff-induced corneal deformation imaging on two meridians, an flagship milestone of the IMCUSTOMEYE H2020 Innovation Action. An informal progress meeting of the project was held in Honolulu (Hawaii) the past 30th of April, coinciding with the presence of many of the IMCUSTOMEYE partners at the ARVO 2018 Annual Meeting, the largest gathering of eye and vision researchers in the world. The partners present at the meeting were Instituto Oftalmológico Fernández-Vega, Polish Academy of Science, Oculus Gmbh, IROC Science and CSIC. The meeting started with the presentation of Judith Birkenfeld's poster (“Assessment of ocular mechanical resonances using phase-sensitive OCT and frequency-domain air puff stimulation”), followed by a team discussion to follow up on the different action items, technical advances and administrative and logistical aspects of the IMCUSTOMEYE project for the following months. ​The IMCUSTOMEYE project, a competitive H2020 Innovation Action of the Photonics KET Program, has just been launched under the leadership of the Visual Optics and Biophotonics Laboratory (Institute of Optics, CSIC; Principal Investigator: Susana Marcos). IMCUSTOMEYE will develop a novel non-invasive label-free imaging-based in-depth diagnostic tool to create a step change in the paradigm for diagnostics of vision-threatening conditions including keratoconus, myopia, glaucoma, cataract and presbyopia, some of which potentially lead to loss of independence and productivity, with an impact on their treatment. The prevalence of these conditions ranges between 0.05% (keratoconus) to 100% (presbyopia in population >50 yr), and increase with age. Current standards for diagnosis and therefore treatment rely on limited quantitative information preventing treatments to be customised for individual patient’s needs. The proposed in-depth diagnostic paradigm will make use of morphological, biomechanical and optical biomarkers acquired from a new imaging device, based on Optical Coherence Tomography. These will allow creating predictive customised eye models that can guide diagnosis and treatment of individual patients. The optimisation and customisation of diagnosis, which has not been possible before, are expected to lead to significant improvement in both the provision and cost of eye healthcare.